Next on The Scoop: What Weird Foods Do Your Cats Love to Eat? Do Your Cats Demand Snuggle Time Like Mine? They want to cuddle on their terms, and they won't be refused. Does that sound like your cats? 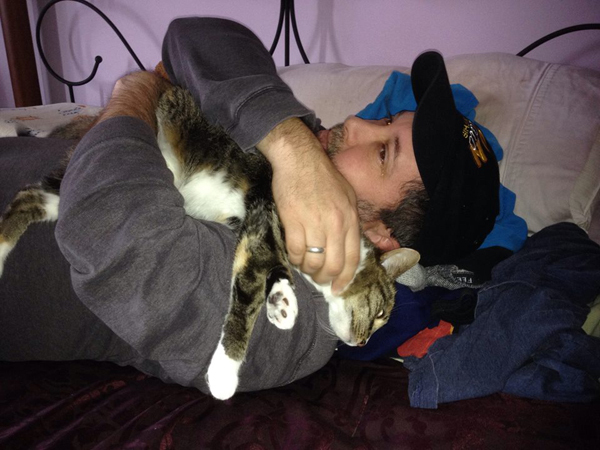 Generally, my cats are not snugglers — at least not on my terms. Sometimes I just want to pick up one of my kitties, plop them in my lap and insist on some serious purring and cuddling. It’s good therapy, right? My cats can be complete snuggle-bunnies when they want some cuddle time. In fact, they demand it sometimes … and believe me when I say they will not take no for an answer. Cosmo is the king of demanding snuggles, usually when I’m working at my desk. Typically, this works for me. 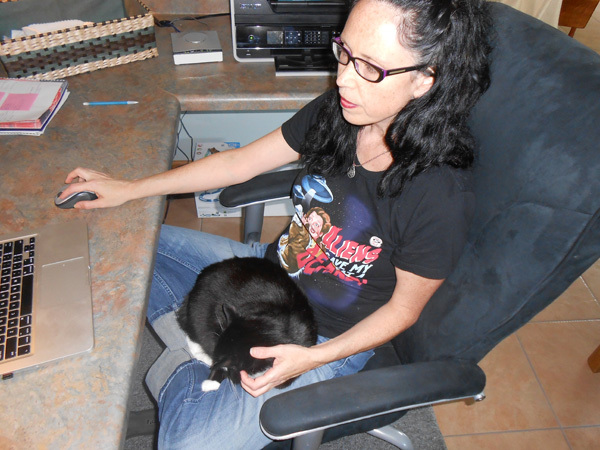 In fact, I do believe I work better with a cat in my lap. I write about cats most of my workday, so a laptop muse works quite well! Like I mentioned, Cosmo’s ploy is the laser stare, rinse and repeat until I finally cave. Occasionally Phoebe wants lap space and her method is a little more aggressive than the laser stare. She walks across my desk — over my keyboard, sometimes — and completely hijacks my lap. 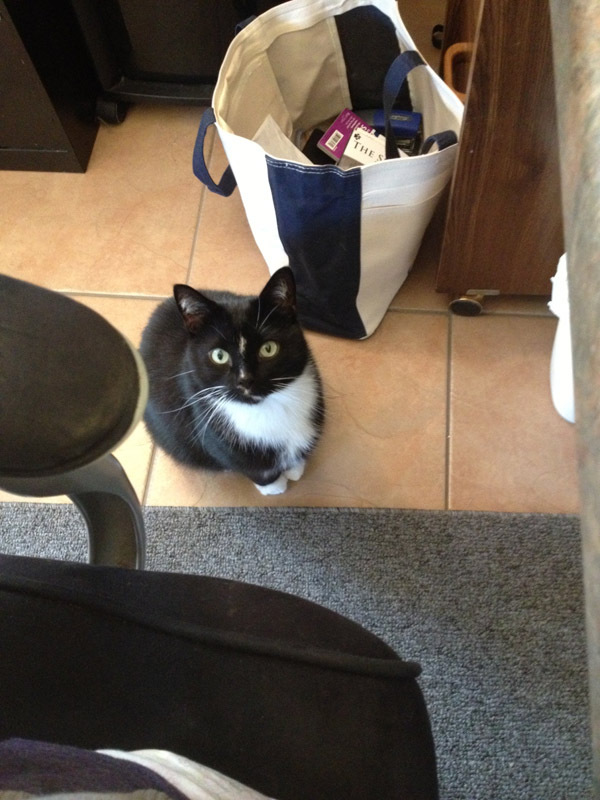 She doesn’t wait for an invitation, and she might even bat some of my pens onto the floor on her way to the lap. She takes what she wants. If Cosmo happens to be in my lap when Phoebe’s coming in for a landing, her ears flatten and she looks at me like, “Aren’t you going to do something?” Then she eventually stalks off, leaving a contrail of snark. Phoebe is extremely routine-driven and has come to enjoy evening snuggles with my husband. I go to bed earlier than he does, so at around the same time every night, he follows me into the bedroom to chat while I’m getting ready for bed. Phoebe lies on the bed with him, purring and cuddling until I tuck myself in and say goodnight. 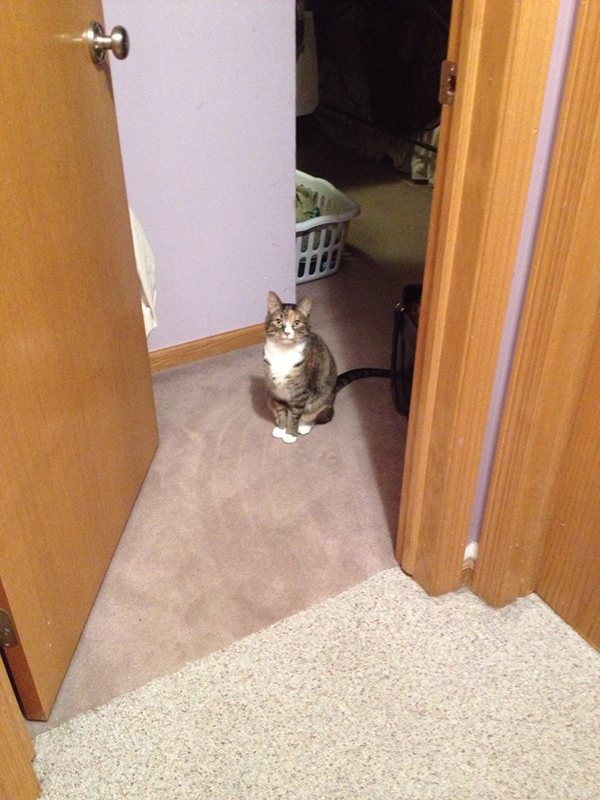 If we aren’t heading to the bedroom at the usual time, she stands at the bedroom door and stares at us. If my husband happens to pass her when he’s going to the bathroom, she races ahead and jumps on the bed, meowing excitedly. Even if I’m not ready for bed, he can’t resist lying down with her for at least a few minutes. It’s really the most adorable thing. While I’m brushing my teeth I can hear him baby-talking to her — I, of course, melt. She walks all over him, demanding to be petted in certain spots. I suppose that’s what living with a cat is all about: They demand and we give in. We cat lovers are suckers, the whole lot of us. Does your cat demand snuggles? Tell us in the comments! What if Cats Held Office Jobs? Worst. Cubicle Mates. EVER! About the Author: Angie Bailey is an eternal optimist with an adoration of all things silly. Loves pre-adolescent boy humor, puns, making up parody songs, thinking about cats doing people things and The Smiths. Writes Catladyland, a cat humor blog, Texts from Mittens (birthed right here on Catster) and authored whiskerslist: the kitty classifieds, a silly book about cats wheeling and dealing online. Partner in a production company and writes and acts in comedy web series that features sketches and mockumentaries. Mother to two humans and three cats, all of which want her to make them food.